I’m back! Yep it’s been nearly two months and in that time I’ve almost forgotten how to use WordPress and Twitter and everything else tech-related. I really dislike living online and I find the fact that it has become essential to my life both unnerving and frustrating. Ironically, I missed the best part of an important event last week because I hadn’t been checking my Twitter feed. Curses! Luckily my friend and sustainable fashion maven, Amy Davidson, alerted me before it was too late. Amy has also supplied all the photos on this post because she’s got a swish camera and knows how to use it. Thanks heaps! The event in question was called Everything Must Go, and featured discussions and a series of installations, created as a culmination of 5 years of research. The research project itself, The Waste of the World, brought together researchers in geography, anthropology and materials science from a number of universities, including the University of Sheffield and Goldsmiths, London. The programme sought to rethink the concept of waste, by providing global analysis of current waste management and exposing the economic, social and environmental implications of waste in the fields of textiles, food, ships and nuclear energy. 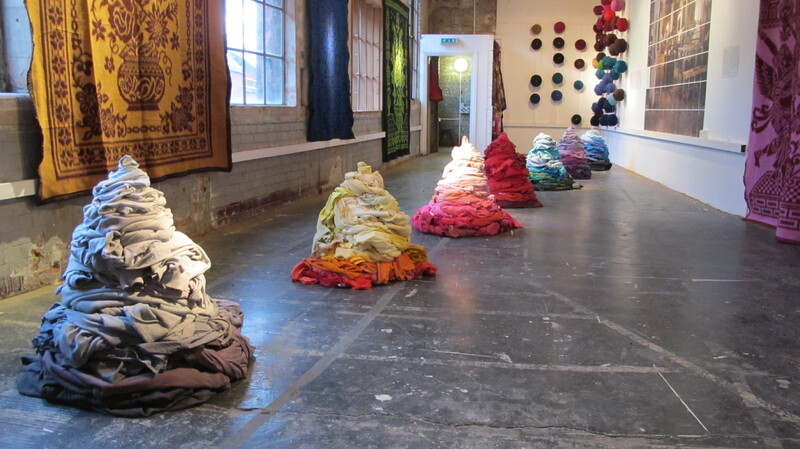 Last Saturday, a program of talks and discussions was held at Bargehouse, London, involving such doyennes of the sustainable world as journalist Lucy Siegle, Kate Goldsworthy, Director of MA Textile Futures at CSM, and Sarah Farquhar, Head of Retail, Oxfam. Of course I missed this part, because I was in offline mode. Grr! The following day I managed to view the installations that were both informative and thought-provoking. Visually, the set-up was quite impressive, especially since this aspect is often lacking at events that concern the environment or ethical fashion. The consideration given to aesthetics really elevated the subject matter and added poignancy to industrial practices. The Bargehouse itself is a series of meandering stairwells and hidden rooms with exposed brickwork and acted as the perfect location to reflect the industrial nature of clothing recycling. One small room showed a video of clothing being shredded by an imposing industrial machine with huge metal teeth. Trust me, once you’ve seen a cute child’s boot being unceremoniously eaten several times on a looped video, you begin to feel a bit uneasy. It just seems so strange, when confronted with the birth, life and death of a garment, I began to wonder again, how can we justify the excessive damage of fashion production? Another rather moving piece was a short film by Meghna Gupta, called Unravel. In it, the world of textile recycling is explored through the eyes of textile workers in Panipat, India. The women in the film react incredulously to the types of Western clothing they process, and surmise that water is so expensive in the west, it must be cheaper to buy new clothes rather than wash them… indeed. Sadly the above quote still accurately describes the textile recycling industry. 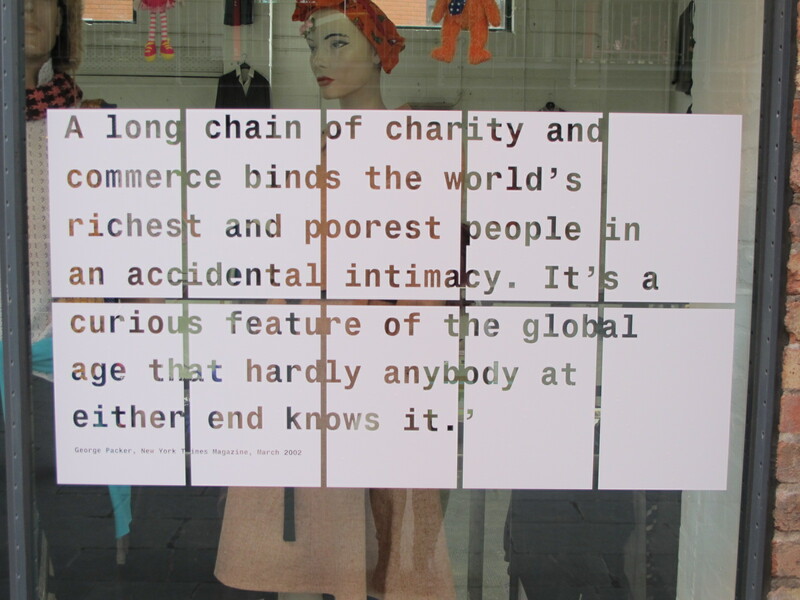 Think about all the clothes you’ve graciously donated to charity over the years. Where are they now? Some have been reused, some were shredded and recycled into shoddy blankets in India and some are lying in landfill. One thing that emerged quite clearly for me, was the difference between upcycling and downcycling. I think we all know what upcycling is by now; the concept of altering or adding something to an unwanted garment to evolve it into something better. Downcycling it seems, is the opposite; where perfectly wearable but unwanted garments are shredded, resulting in low-grade fibres that can only be used to create something of low value. We recall the perfectly wearable child’s boot becoming dust before our eyes. I am aware of how over-simplified, and possibly condescending/sanctimonious that sounds, but if we thought more about every item we were about to give or throw away, maybe we could find actual uses for things, rather than patting ourselves on the back for giving clothes to charity, which are often more of a hindrance than a help. Key issues raised by the research include the need for designers to assess how their products will be disassembled, and what the broken-up fibres might become, as an integral part of the design process. Likewise, there is a need to dispel the myth that recycling is “clean and green” when in fact, most of the time it is dirty and dangerous work. For more information, take a look at the Waste of the World YouTube channel. 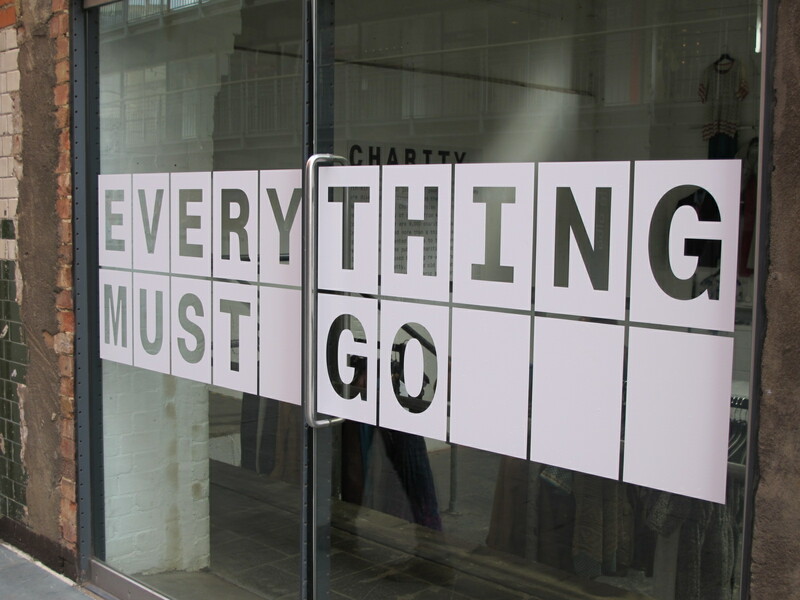 The title of this exhibition, Everything Must Go, recalls the Manic Street Preachers’ song of the same name, with the lyrics, “I just hope that you can forgive us, but everything must go” As we speak to future generations, is this the only excuse we can offer? This entry was posted in Downcycling, Ethical fashion, Recycling, Sustainability, Upcycling and tagged Amy Davidson, Bargehouse, clothing supply chain, ethical fashion, Everything Must Go, garment workers, George Parker, Goldsmiths, Kate Goldsworthy, Lucy Siegle, Manic Street Preachers, Meghna Gupta, Panipat, recycling, Sarah Farquhar, The Waste of the World, University of Sheffield. Bookmark the permalink.